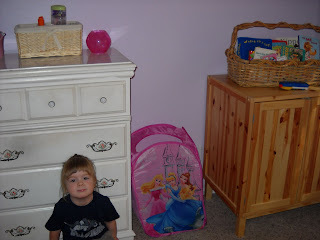 My purple photo for Wordless Wednesday was of Lydia's room! We finally (!) emptied the room of the old office stuff and got it ready for our princess to move in. Bo finished turning our back patio into an office months ago, but I was stuck for some reason on emptying out the rest of the stuff that was piled in that room. Once I stopped calling it the "old office" and started calling it "Lydia's room" something shifted and I was able to empty it out. We let her choose the color. 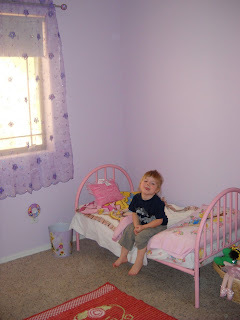 She went back and forth between pink and purple, so we headed over to Lowe's and pulled out pink and purple paint chips. I fanned a few out at a time and let her choose, and we finally narrowed it down to this one -- I believe it was called "Vinca" It's a beautiful lavender, and I like it quite a bit! 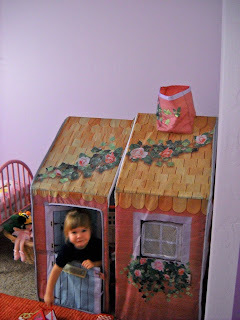 And our little girl has her own room! She's still not sure about sleeping in it, but we know that will come with time. Our routine for most of her life had her falling asleep in our bed, then being moved, that we're still following that. We read books and snuggle till she falls asleep, and then we move her to her bed. The early morning hours find her in our bed again, but we know that with time she'll spend full nights in her purple room. Did you play Wordless Wednesday? Don't forget to follow it up today with Tell Me Thursday!